Liverpool has an unusual gravity. 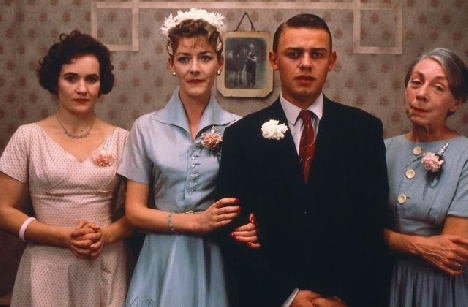 Witness Daviess richly detailed portrait of working-class life and youll feel the extreme pull of the Liverpudlian past. Its an homage to (and a forgiveness of) the daily trepidations of growing up in a brute household, ruled over by a stern father (the grand Pete Postlethwaite) and a doting mum (Freda Dowie). But Davies also finds strange comfort in this distant and fading abode of the forties and fifties. The sibling bonds, the familiarity of shared diversions, the gathering experience of class and culture, all these things accumulate a weight that is a burden and an embrace. Davies, who won the Critics Prize at Cannes for this extraordinary film, regains the past through remembered moments seamlessly entwined in a web of fervent associations. The resonance is bolstered by popular songs, often issued in the lively voices of the films characters. Swinging between joyful weddings and melancholic funerals like the end points of a pendulum, Distant Voices, Still Lives recalls a very human time.